Your Guide to Exploring New Jersey's Revolutionary War Historic Sites! Nothing creates an understanding of and excitement for history like standing in the actual locations where historic events occurred. 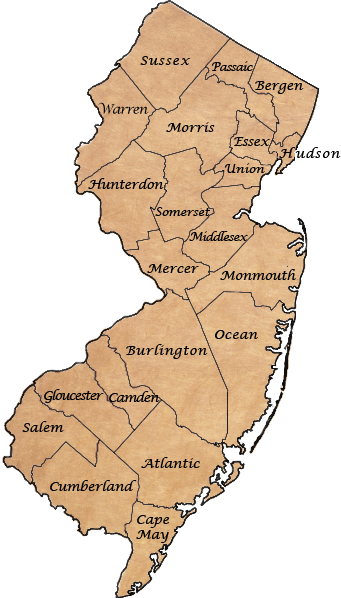 New Jersey played a central and crucial role in the events of the Revolutionary War. Throughout the state, we are surrounded by links to that history. George Washington spent more time in New Jersey than anywhere else during the Revolutionary War. Many of the locations where he and the Continental (American) Army marched, encamped, and fought battles are still here to be explored. Throughout the years of the Revolutionary War (1775-1783), the lives of New Jersey citizens were dramatically affected by the events of the war which went on around them. Some of their houses and buildings are still standing; each of these structures has its own story. This website provides the tools to help you find and understand these locations which played a part in New Jersey's Revolutionary War story. It contains photographs, information, and directions for almost 650 Revolutionary War historic sites located throughout all twenty-one New Jersey counties. From the Continental Army's desperate 1776 retreat from Fort Lee across New Jersey to the crossing of the Delaware River, from the Battle of Monmouth to the brutal winter of 1779-1780 the Continental Army spent at Morristown, from the Battle of Springfield to Washington's headquarters at Kingston where he received news of the end of the war, New Jersey's role in the founding of the nation was vital. Use this website as a guide to explore it for yourself first-hand.